This course is about our shared mission to help each other and the suicidal people we may meet on our journey through life. The course is text-based and teaches you how to use the best-selling "Suicide: the Forever Decision" book to help someone considering suicide. The book is available free on the QPR Institute web site, or through Kindle e-books, or at your bookstore. The course also includes module on basic helping skills. Note: If you are a mental health professional required to complete a training program in suicide risk assessment, treatment, and management, this training program has not been submitted for review to state authorities for approval to meet these emerging licensing requirements. We suggest another course covering the required content, e.g., the QPRT Suicide Risk Assessment and Risk Management training program. The following email arrived at my office on June 1, 2011. Many like it have been written to me over the years. Tomorrow, June 1, will be the 13th anniversary of my brother's suicide. His death was protracted and painful. Having suffered from depression off and on most of my life, I have considered suicide as well. After Greg killed himself, I vowed that I would never do it, because unlike him, I knew the effects and pain it would cause other people. But the month of May has been very emotional for me since his death. It's been a tough year. My second marriage ended in divorce; I moved to another state to be closer to family, and it hasn't been the ideal situation that I envisioned. On top of grieving the loss of my marriage and all my dreams and hopes for that life, I am incredibly lonely as I struggle to figure out a new path for my life. Add all that to the anniversary of Greg's death, and the logical solution to the pain I have been feeling seemed to be suicide. Last night, I was serious about it. I found a video that explained how to do it. But somehow, I found myself browsing through suicide hotline websites as well, and stumbled upon your book. Your book helped me immensely. It made me realize that my situation is not unique. You reminded me that these feelings of depression that I have do pass. I laughed thinking about all the things I do to take care of myself--work out, eat right, visit the chiropractor, get my hair done--while contemplating suicide. Everything you said made sense. You talked me down from the proverbial ledge. Because of your book, I am going to give myself some time for the storm clouds to pass. I might feel this way again, but if I do, I will refer to your book for strength. Last night, and tonight, you saved my life. Help me share my book. You can share my book with someone you know and maybe help save a life as Stephanie saved her own. Without going into a lot of research and detail, the fact is that suicidal people are often on their own when they are in crisis and help is simply not there for them. Yes, they can call a crisis line if they have the number, but many can't or won't, and for all kinds of reasons. Yes, mental health professionals are supposed to be there for them, but many times access and fees are a barrier, and even if they see a mental health professional he or she is often poorly trained in how to talk openly and frankly about suicide -- the first step in reducing fear and moving beyond shame and stigma. Yes, hospital emergency departments are supposed to be there for them, but many times they are too far away and ED staff are typically poorly trained and even rude to suicidal people. Yes, psychiatric hospitals are supposed to be there for suicidal people, but hospitalization is often too much medicine for the problems the person is trying to cope with, inpatient stays are short, and there is almost no scientific evidence that hospitalization for suicidal thoughts and feelings is either safe or effective in the long term. The bottom line is this: too many people who begin to contemplate suicide as a solution to life's problems are left alone to struggle with this terrible decision. But you can make a difference! The answer is simple: suicidal people may not get any help unless you offer it. Outpatient mental health may be a no-show. A letter recently published in the July 2011 issue of the Annals of Emergency Medicine found that Harvard doctor-researchers posing as patients experiencing severe depression found only 8 of 64 approved medical centers were willing to offer them an appointment within two weeks. The researchers had excellent health insurance. When they asked for an appointment they said, "I was seen in the emergency room last night for depression and discharged with instructions to get a followup psychiatric appointment in two weeks.” Twenty-three percent of the centers refused an appointment at all, and another 23% never bothered to return a call even after a detailed and urgent message was left. Imagine if the researches had used the word "suicide" in the request. For suicidal people, treatment delayed is treatment denied. 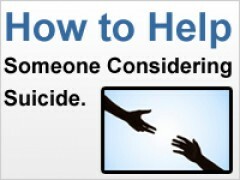 Let me ask you: What better pay is there than to save a life from suicide? Note: this course is not designed to make you a professional therapist, but it is designed to offer you a team approach to helping someone who may otherwise never get any help at all. The team is you and me. Completing the modules and passing the quizzes helps qualify you as someone who has taken at least six hours to learn how to help someone suicidal, which is typically six more hours of specific suicide prevention training than the majority of licensed mental health professionals. As of this writing in the Spring of 2011, the QPR Institute has trained more than 7,000 Certified Gatekeeper Instructors who have, in turn, trained more than one million gatekeepers worldwide. In addition, thousands of clinical health care providers have been trained in how to detect, assess, and manage suicidal consumers. If this sounds like an "army" of people helping to prevent suicide, it is. But it is still not enough. We need you, too. While expert opinion may differ as to what helper competencies are required to prevent a given suicidal person from acting on a desire to die, what you will learn in this course has been shown to be helpful - at least to suicidal persons. You can read their reviews of my book on any number of bookseller web sites. Sure, some people didn't find the book helpful, but most did. One of your first assignments will be to read the book. If you don't like it, then we'll refund your fee for this course. To make the book even more available to suicidal people, it is now an iPhone app, in both English and Spanish. By completing all modules of this course you will receive 6 hours of continuing education credits by the National Board of Certified Counselors. If you are not a counselor, you may not need these, but you will have earned them anyway and they will show up on the certificate you may print at the end of course. If your professional organization does not offer continuing education for this course, it will be your responsibility to make that request of the organization. The QPR Institute is happy to provide reviewer access to this course to conduct an audit for accrediting purposes at no cost.